The annual Armed Forces Day was marked with a flag-raising ceremony at County Hall, Maidstone, attended by military personnel, British Legion veterans and KCC members and staff. David Brazier, the Chairman of KCC, welcomed attendees and explained the relevance of the event. “The occasion is a national show of support for Britain’s Armed Forces past, present and future,” he said. 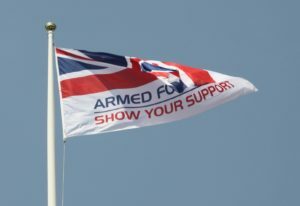 “Authorities across the United Kingdom are invited to fly an Armed Forces Day flag and are joined by Government departments, overseas territories and military bases across the world. “This is an opportunity to raise the flag in recognition and honour of the men and women who make up the Armed Forces community, including service families, cadets, veterans and recruits. Armed forces day from Kent County Council on Vimeo. June 20, 2017 in Community, Home, Media Releases.